Do you ever feel unbalanced? I have. All the time. Last night, something really strange happened. So strange that I’m certain I won’t be able to explain it very well in this post. But I’ll try in a moment. I created this project only to find out this morning that it resembles something Buddhists have been drawing on Buddhists temples for thousands of years. 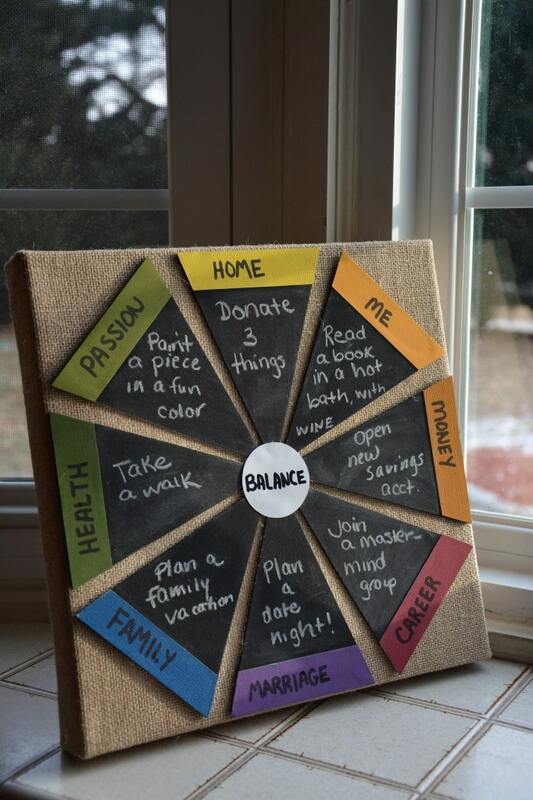 I wanted to make something that I could easily hang near my desk that would allow me to keep my priorities straight, for times when I’m feeling unbalanced and unhappy with how I’m managing my time. 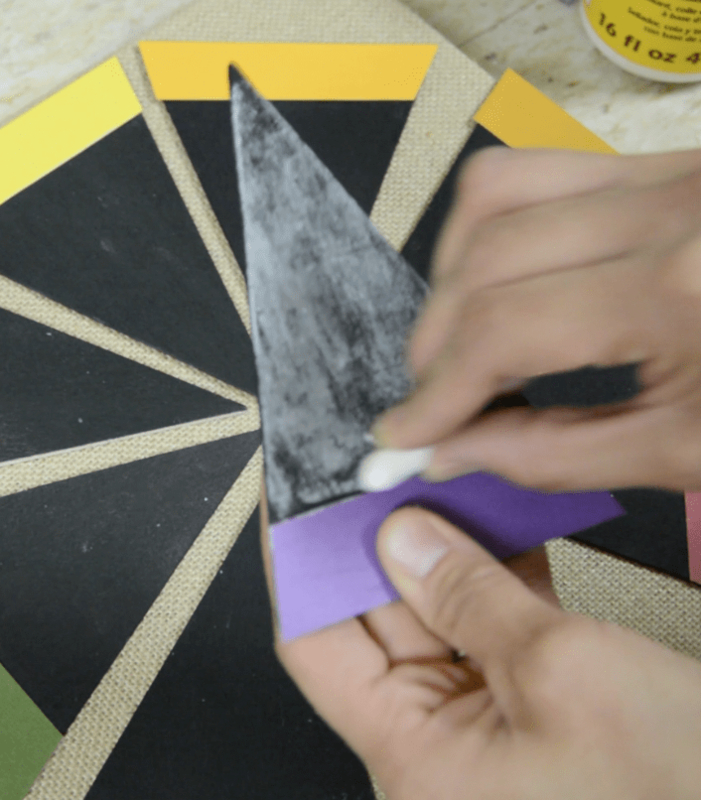 …and 8 wooden banner triangles…. what I now realize is a Wheel of Life, according to Buddhists. What I didn’t realize when I finished this project is that I unknowingly channeled this Buddhist image (known as bhavacakra, which means “wheel of life”), which has been found on outside walls on Tibetan Buddhist temples. Where Did THAT Inspiration Come From?! I couldn’t tell ya. I have no idea. I’ve never even seen this Buddhist Wheel of Life before. Never even heard the term. But down to the finest detail of a “CIRCLE” in the middle, our images are almost identical. What’s even freakier is that in the pic above, some crazy guy is holding his wheel of life, just as I am below. And–no lie– my husband snapped this picture this morning. So many resemblances. But seriously…how strange is that?! It makes me wonder if our creativity is really just our inner, authentic spirit speaking to us. Well, I’m listening loud and clear now. 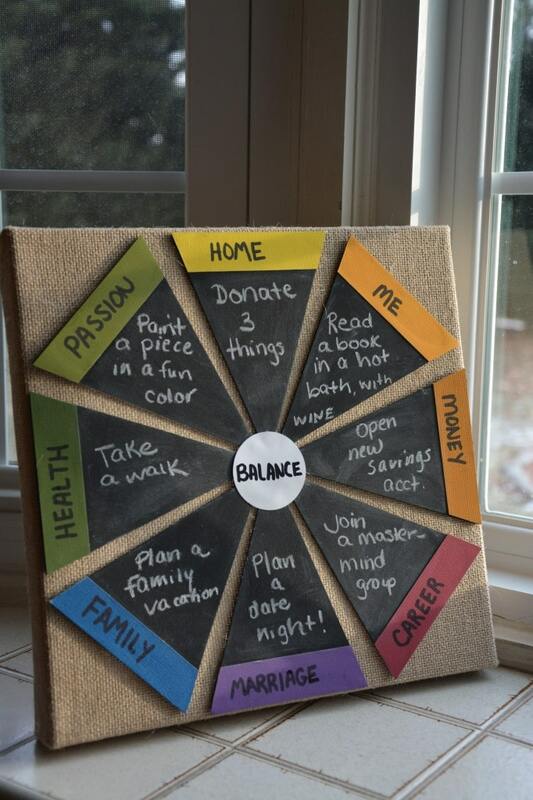 So How Do You Make Your Own DIY Wheel of Life? 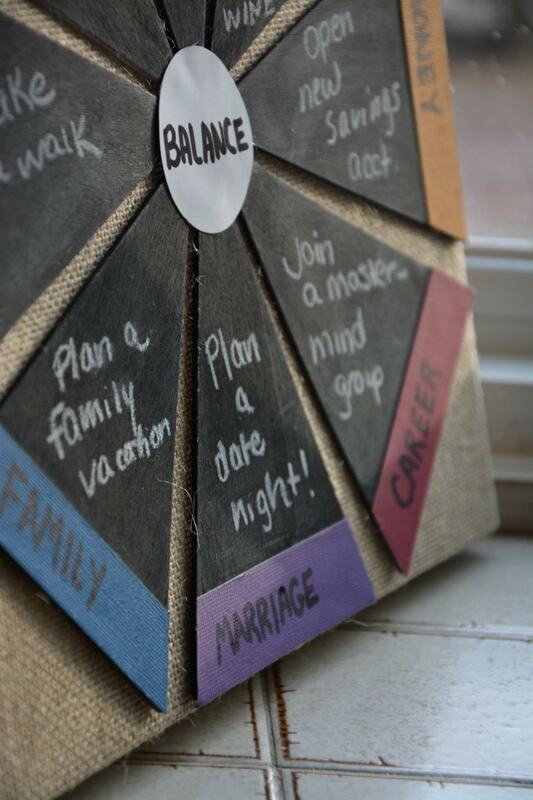 What I like about this project is that every day…..every week….every month….you can erase and change your goals, making sure that each of the slices of your life get enough love and nurturing. It’s so important. 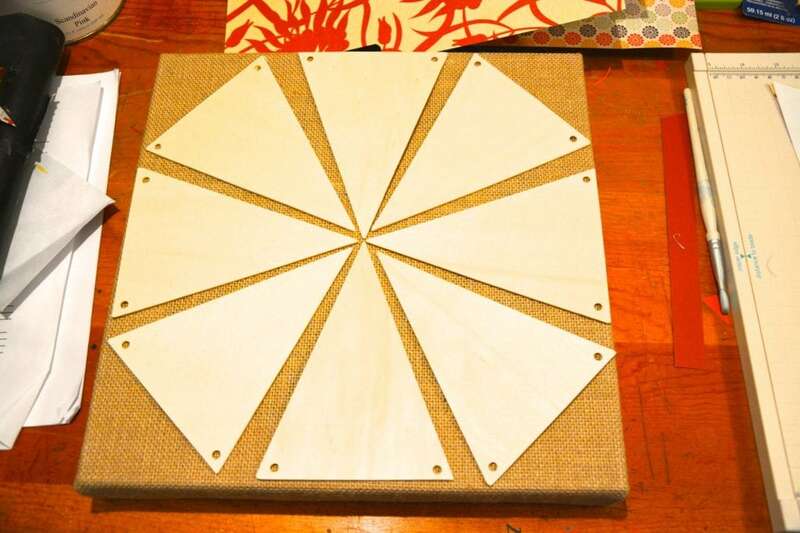 Lay out all the banner pieces on the stretched burlap to form this shape. 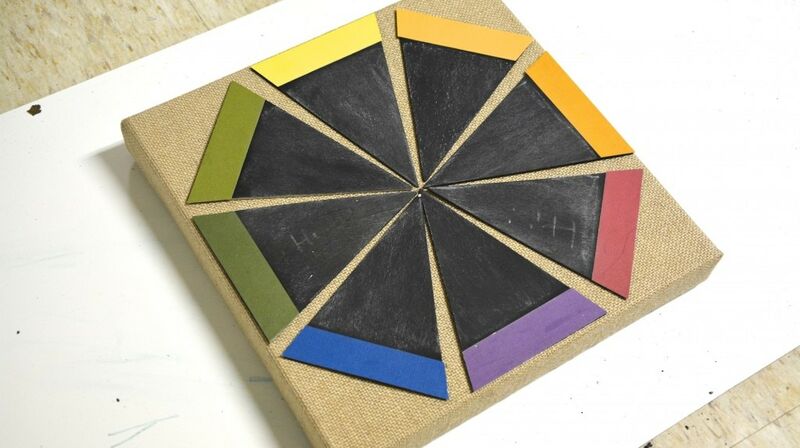 These “slices” will represent one important area of your life for which you want to create goals and balance. Grab some cardstock and get make Roy G. Biv (red-orange-yellow-green-blue-indigo-violet, for all y’all folks that don’t know). 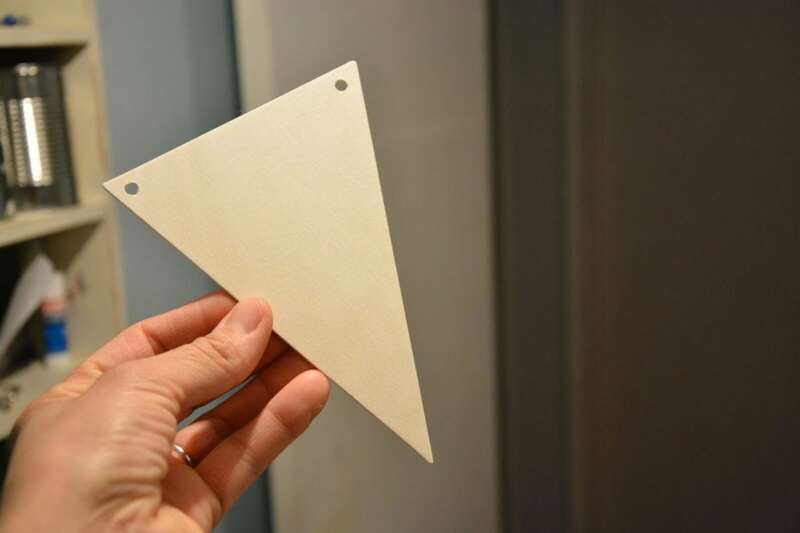 Use scissors or a paper cutter to cut slips of cardstock to fit on top of the banner. You’ll use these as the labels, and to cover the holes. Okay, so I made a fatal error (gasp!!). I forgot to prime the before spraying on the chalkboard paint. Because of that, I’ll probably not get as durable a finish. But you know what?? For only a dollar each, who cares? Don’t forget to “prime” your chalkboard banners. Run chalk over them like this to “set” get the chalkboard surface ready for writing. STEP 6: Pass Me the Glue Gun and Marker! 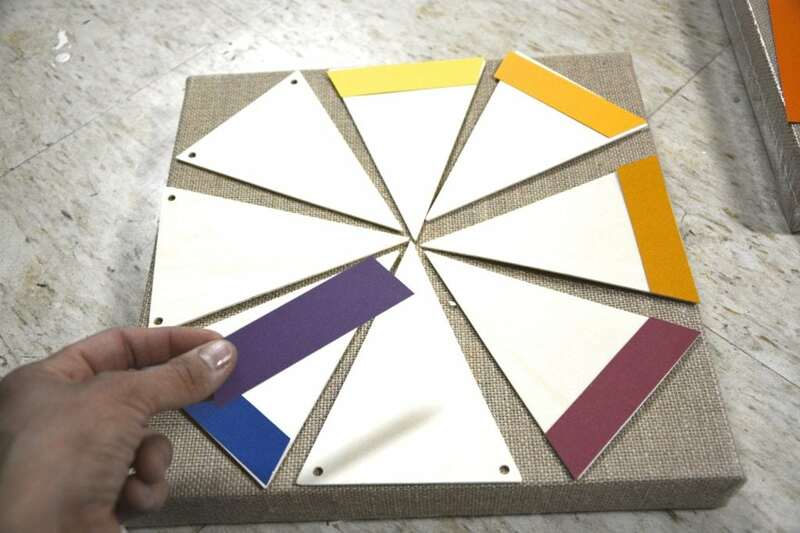 Now glue each of the slices down in the pattern you designated. 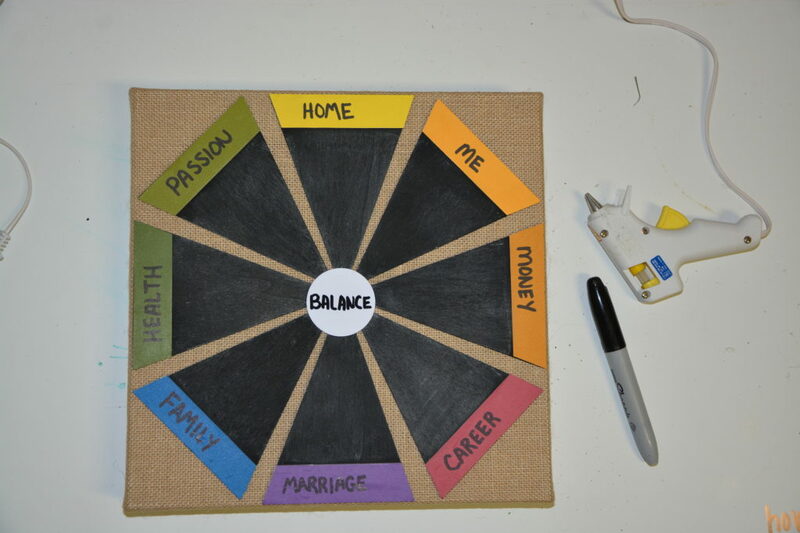 Use a fat marker to label your slices of life :). You can stencil the names on, to make it look more neat. Add a circle in the middle. Label it whatever you like. 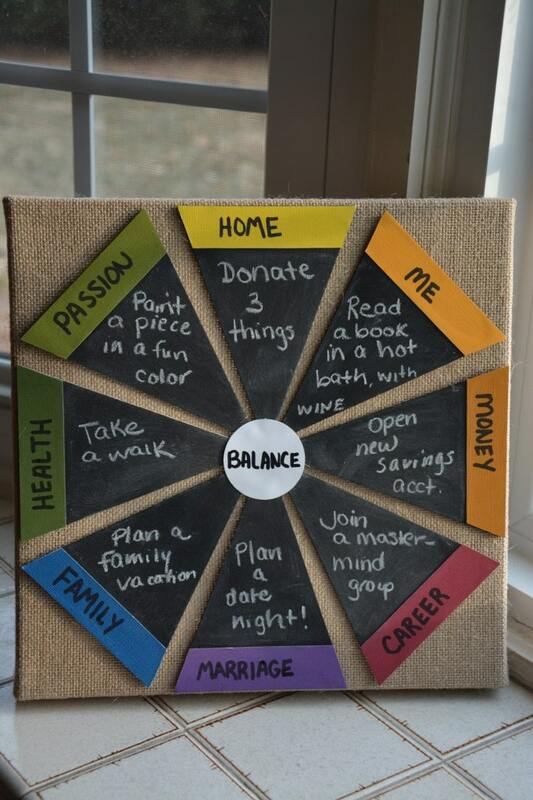 I like “Balance” as a reminder. Use hot glue to secure it. The most important lesson here is to be mindful of all parts of your life. It’s so easy to get consumed by one area. For me, it’s blogging. I looooovvvveee what I do. But as a result, I ignore my poor husband in the evenings. And my health suffers from lack of sleep or exercise from hours and hours of sitting in front of the computer. Hopefully after this project, I’ll find my perfect balance. Do you ever feel off balance? 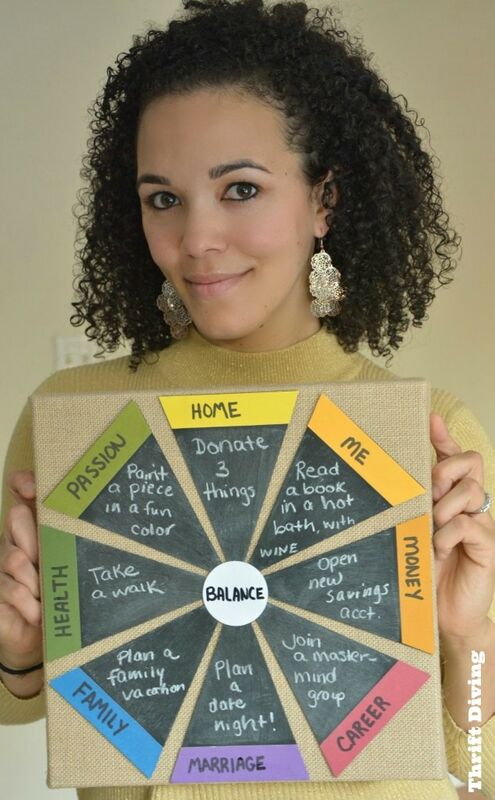 What do you do to get your life back in order? « When Should You NOT Paint Wood Furniture? What a great idea! 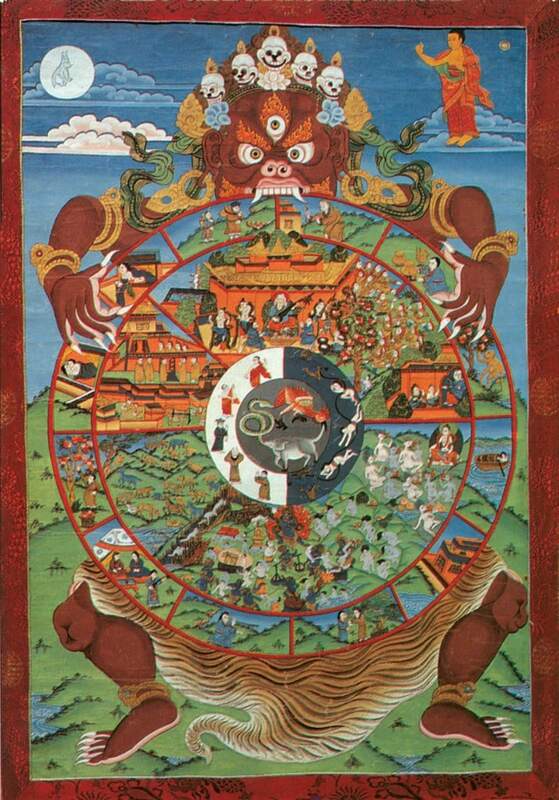 It really is eerie how much your project resembles the Buddhist wheel of life. I think there are common themes that resonate through all of us, regardless of our culture or background. A desire for balance is one of them. 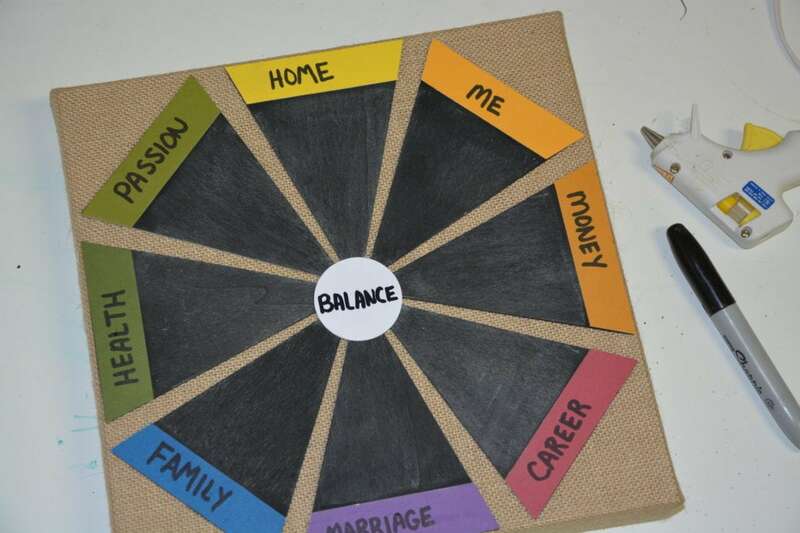 Your wheel of life is a fabulous reminder of how to achieve and maintain balance in your own life. Thank you for posting this. It makes things so simple and the colours make it visible and easy to keep track of. I really need to do this, lately my life has been so hectic, it’s not even funny. I love doing things for others, but I hardly do anything for myself. This project will be my cheat-cheat to remind myself I also deserve “me time”. I went to JoAnns looking for the banners and could not find. 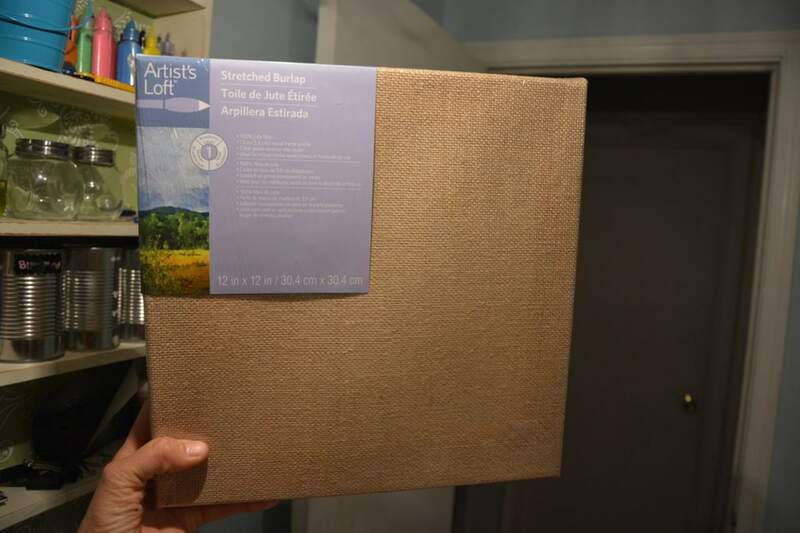 I am trying to figure out a way to make this awesome project with items I already have (on a tight budget) so, I already have regular stretched canvas that I was going to just paint on. the chalk paint I have is purple. 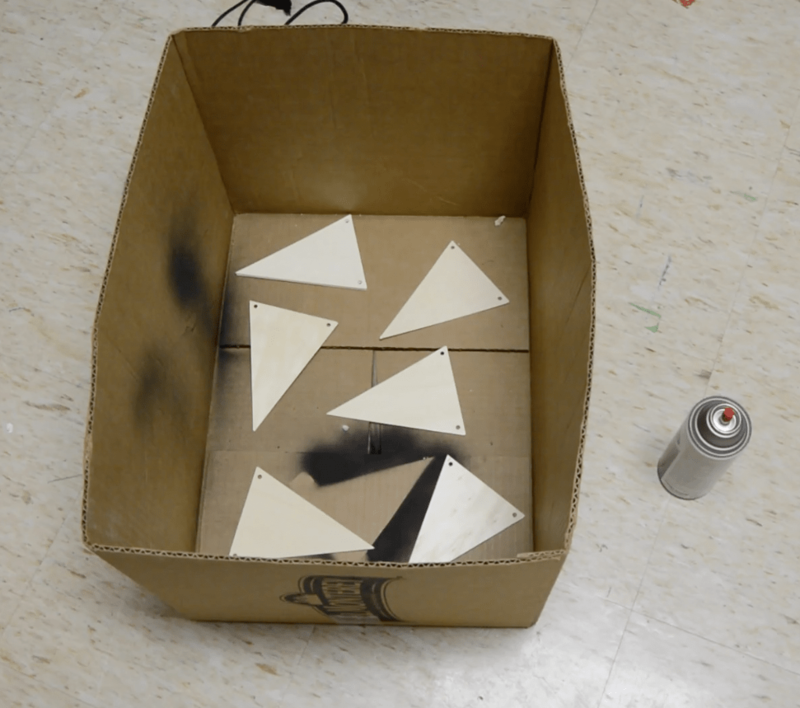 Since i cant find the banners …I thought i would just paint the triangles on the canvas….using purple chalk paint …Is the canvas too porous for the chalk paint to work on it? . I do have a glue gun and card stock…just limited color paper. What do you guys think? Hi Sonia! How exciting you’re going to make this project! Let’s see….. I think doing it on a canvas you already have is totally fine. You could even do it on a piece of scrap wood (if you have one lying around. And I think the chalk paint would hold chalk, too. If you wanted to buy supplies, and you have a Michael’s around, I actually saw the paper chalkboard banners in a booklet-type thing. I think it was $10. But if you used one of their coupons, you could get it for less. As for the cardstock, you can use white paper and color it in with crayons or markers if you wanted! 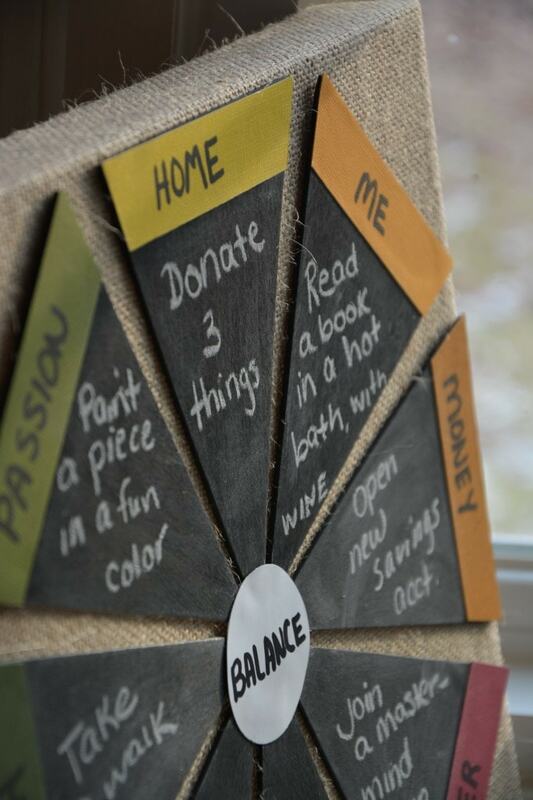 Or, you can use your own scrapbook paper for something more decorative instead of the “balance” color wheel. Be creative, and don’t feel you’re limited! 🙂 Thanks for commenting, and when you’re done, email me your finished project! Wow what a great idea! I need to create one for myself. Nikki, hey! It’s so simple, you could do it in 1 hour! Someone on my FB today suggested adhering the pieces with velcro so you can remove them as you achieve your goal. LOVE that idea!!! Thanks for commenting! 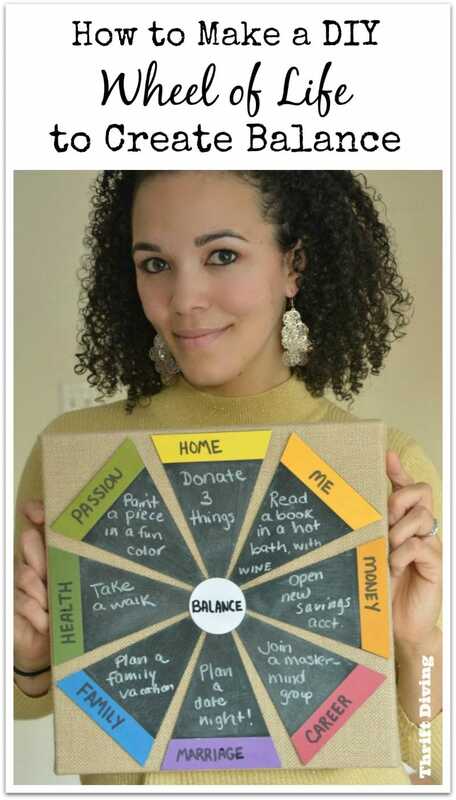 This is my favorite of all of the projects that I’ve seen posted for the party on Sunday. I like that you can keep this on your desk or on your kitchen counter as a reminder of what you want to do. I get so bogged down in what I have to do that I often feel that my own personal wants and needs don’t get taken care of. 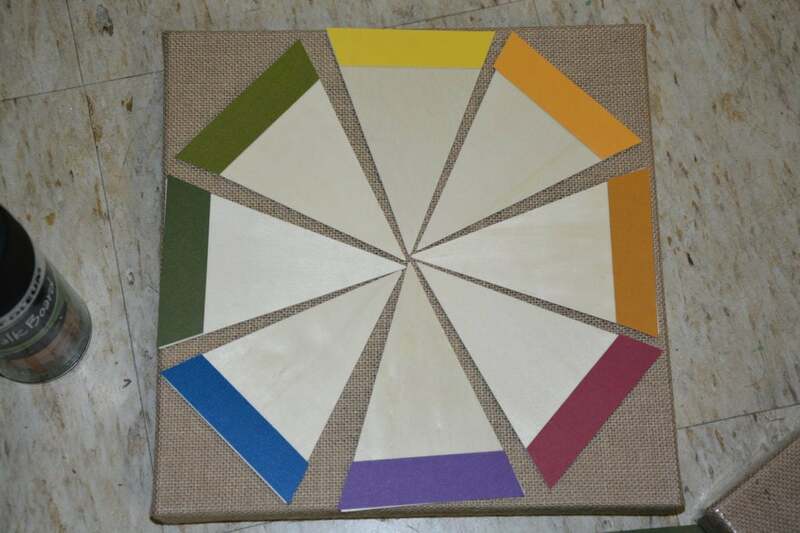 Great job on this project, Serena! Paula, wow, really?! What a compliment! I know some of the ladies really pulled out some cute projects, but I just couldn’t follow the herd 🙂 This was speaking to me way too deeply 🙂 I’m not sure where I’ll keep it yet, but somewhere visible for sure! I want to hold myself accountable. Thanks so much for commenting! This project is amazing! It really resonated with me today! Thank you Serena! <3 it. Keep it up. Meredith, this makes me happy to hear!! I’m glad I could strike a chord in you 🙂 It was sort of a powerful moment for me, too, discovering that what I had created has ancient roots. And I had no idea….smh…. LOL Thanks for commenting! !